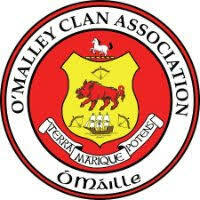 The O’Malley Chieftain and the O’Malley Clan Association invite you to Limerick for a unique weekend of music, song, heritage, history, and social activities. Walking tour of Historic Limerick, led by Dr Liam Irwin, distinguished historian. (maximum 25 people). Official opening by the Mayor of Limerick. See how O'Malleys have featured in the arts, politics, sport and other fields. Includes an exhibition of ceramics on the theme Terra Marique Potens. Friday 21st – Friday 28th June 2019. Programme to be announced - lunch included. Pick up at Strand Hotel & Cappavilla Village (UL) (Exact location TBC). For full details on the workshop and speakers click here. Enjoy a three course meal in the rooftop Harris Suite of the Strand Hotel with spectacular views over the Shannon river and Limerick City. Official welcome from Chieftain Brendan O’Malley followed by traditional music, song and dance. Time to meet old friends and make new ones in the spectacular rooftop Harris Suite, with views over the Shannon and Limerick City. Special O'Malley mass celebrated by Cannon Donough O'Malley. All members are welcome to attend and share any ideas. Lunch Chieftain's awards, Fundraising Raffle, Inauguration of new Chieftain 2019-2020. 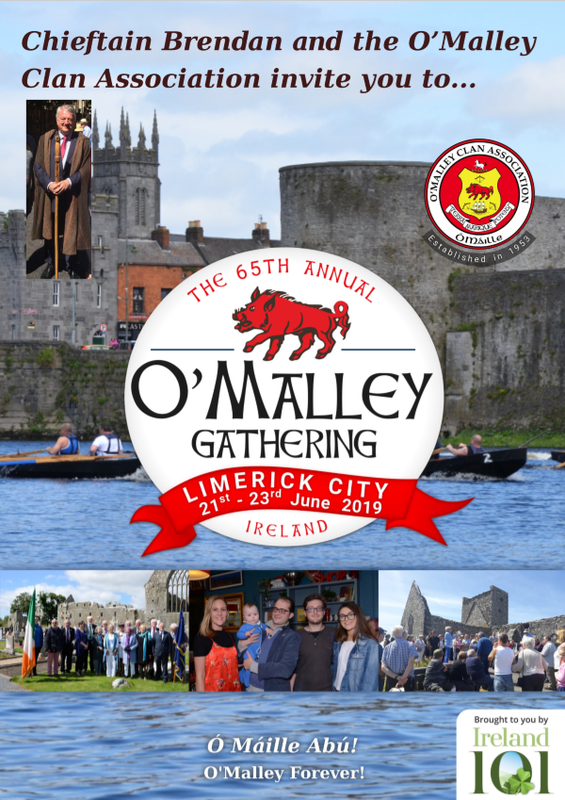 To coincide with the planned exhibition: O’Malleys in Public life – 2019, June 21st to 23rd in Limerick City, we would like to recognise those O’Malleys who may not be as well-known, but whose contribution to the community, arts or sport deserve to be more widely known and celebrated. To find out more or to nominate someone click here. Kids' events including watersports and archery. A taste of what’s in store: click here to view our gallery of previous events. Disclaimer: The organisers reserve the right to modify the programme at any time.